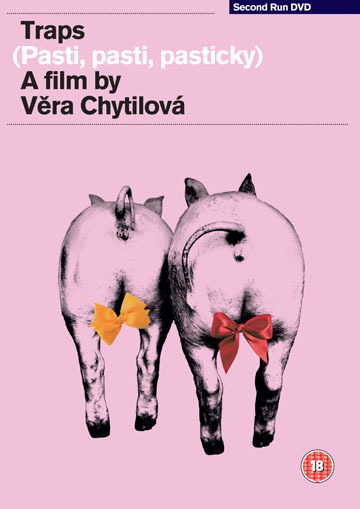 From the late, great Czech filmmaker Věra Chytilová, renowned director of Daisies and Fruit of Paradise, comes a controversial and disturbing satire of violence, violation and veterinary practice. Traps is a daring black comedy about a vet, Lenka, after being raped by two men, uses her particular expertise to exact her revenge. Chytilová was a filmmaker with a deserved reputation as provocateur and philosopher and TRAPS is an enquiry by both ‘victim’ and filmmaker on the social structures and attitudes which condone such a violation. Tragic and comic, wild and angry, the film presents an unique view of contemporary society where warped morality, greed and twisted masculine attitudes are commonplace and unchallenged. 12-page booklet featuring a new essay by arts journalist and film critic Carmen Gray.